There are more than 100 varieties of potatoes in the United States, and they fall into four basic categories: long whites, round whites, russets, and round reds. The most important variety is Russet Burbank, but it does not grow successfully in all areas. Good white varieties for general use are Irish Cobbler (75 days) and Norchip (90 days). Good red varieties for general use are Norland (75 days) and Red La Soda (110 to 120 days). Because there are so many varieties, and the results you get will vary according to growing conditions in your area, ask your Cooperative Extension Service for specific recommendations for your area. The potato is a perennial grown as an annual. It's a weak-stemmed plant with hairy, dark green compound leaves that look a little like tomato leaves, and it produces underground stem tubers when mature. The potato is a member of the solanaceous family, and is related to the tomato, the eggplant, and the pepper; it originated at high altitudes and still prefers cool nights. Potatoes haven't always been as commonplace as they are now. They grew in temperate regions along the Andes for a couple of thousand years before Spanish explorers introduced them to Europe in the 16th century. To encourage the growing of potatoes, Louis XVI of France wore potato flowers in his buttonhole, and Marie Antoinette wore a wreath of potato flowers in her hair to a ball. But the people didn't become interested in potatoes until an armed guard was assigned to watch the royal potato patch. Potatoes need a frost-free growing season of 90 to 120 days. They're a cool- weather crop, and they grow best in areas with a fairly cool summer; the ideal potato-growing temperature is 60° to 70°F. Hot weather cuts down on the production of tubers. Grow potatoes in summer in the North, and in fall, winter, and spring in the South. Plant early varieties just before your average date of last frost, and plant fall crops 120 days before the average date of the first fall frost. If your season is short, plant as soon as possible for a late crop. Potatoes are grown from whole potatoes or pieces of potatoes — these are called seed pieces; each piece must have at least one eye. Always plant certified disease-free seed pieces, and don't try to use supermarket potatoes, which have been chemically treated to prevent sprouting. Some suppliers are experimenting with potatoes grown from actual seed, but these have yet to prove themselves, and the use of potato seed is not recommended at this stage. 18 inches apart, in rows 24 to 36 inches apart. You can also plant in a trench or on top of the ground and cover them with a thick mulch, such as 12 Inches of straw or hay. 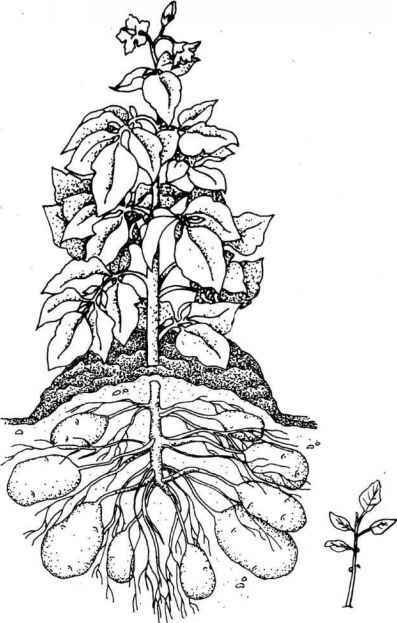 For a very compact plant, you can grow potatoes in barrels, old tires, or large bags — as the plant grows you add layers of soil to cover the leaves and stems. This encourages the plant to produce new tubers. Fertilize before planting and again at midseason, at the same rate as the rest of the garden. Detailed information on fertilizing is given in "Spadework: The Essential Soil" in Parti. For the best production, try to maintain even soil moisture; watering before the soil dries out. A thick mulch will conserve soil moisture, keep down weeds, and keep the soil from getting too warm. Colorado potato bugs, leafhoppers, flea beetles, and aphids attack potatoes. Spray Colorado potato bugs, leafhoppers and flea beetles with carbaryl. Spray aphids with Malathion. Detailed information on pest control is given in "Keeping Your Garden Healthy" in Part 1. Potatoes have so many pest problems they may not be a good choice for the organic gardener. Potatoes are susceptible to blight and to scab, which causes a curly roughness of the skin but does not affect the eating quality of the potato. Plant resistant varieties for the best results, especially for large plantings, and use seed certified as true to type and free of disease. Maintaining the general health and cleanliness of your garden will also lessen the incidence of disease. If a plant does become infected, remove and destroy it to avoid spreading disease to healthy plants. Detailed information on disease prevention is given in "Keeping Your Garden Healthy" in Parti. Time from planting to harvest is 75 to 130 days, and a 10-foot row will give you eight to 10 pounds of potatoes. Each plant will probably produce three to six regular-size potatoes and a number of small ones. Potatoes are fun to grow, and the young new potatoes are delicious. Dig up new potatoes after the plant blooms, or if it doesn't bloom, after the leaves start to yellow. For potatoes that taste like store-boughtones, dig up the tubers two weeks after the vine dies in fall. Use a spading fork to dig the potatoes, and be as gentle as possible to avoid bruising or damaging the skins. Cure potatoes in a dark, humid place for 10 days at 60° to 65°F; then store them in a cold, moderately moist place for four to six months. Be careful not to let them get wet, or they'll rot. Do not refrigerate them. Prepared or new potatoes freeze well and potatoes can also be dried. Detailed information on storing and preserving is given in Part 3. Potatoes are wonderfully versatile in the kitchen — you can boil, bake, roast, fry, puree, saute, and stuff them. The enterprising cook can serve a different potato dish every day for a month. Small new potatoes are delicious boiled and tossed in butter and parsley or mint; don't peel them. Stuff potatoes with tuna and spinach for a nourishing all-in-one dish. Enjoy low-calorie fries by brushing the fries all over with oil and baking them in a single layer on a cookie sheet. Pipe pureed potatoes around the edge of a dish for an elegant garnish. Add cubed, cooked potatoes with other vegetables to an omelette or frittata. Don't throw away potato skins — they're full of goodness. Deep fry them, or simmer them to make stock. When you're mashing potatoes use hot milk, not cold — they'll be lighter and fluffier; a teaspoon of baking powder will have the same effect. A nonedible use for potatoes: Cut a potato in half, and carve a picture or design on the cut surface; ink it, and press on paper for an instant block print. It's a splendid way of keeping the children busy on a wet afternoon. 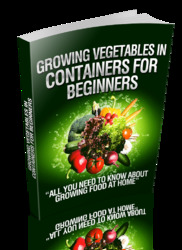 Start Saving Money By Discovering How To Grow Your Own Fruit and Vegetables At Home From Start To Finish. Container gardening does not have to be expensive. With a bit of imagination you can reuse containers and items that are around your home and start your own container garden on a minimal budget. Of course, if you prefer you can buy containers from the store and make your container garden a feature in your home. Is a potato a vegetable?